Advanced PowerPoint to Flash solution extended with customizable Players, audio narrations recording and powerful features to tune your PowerPoint presentations. The key feature of iSpring Pro is its outstanding quality of PowerPoint to Flash conversion. iSpring Pro produces quality looking Flash movies which preserve every aspect of your initial PowerPoint presentation. 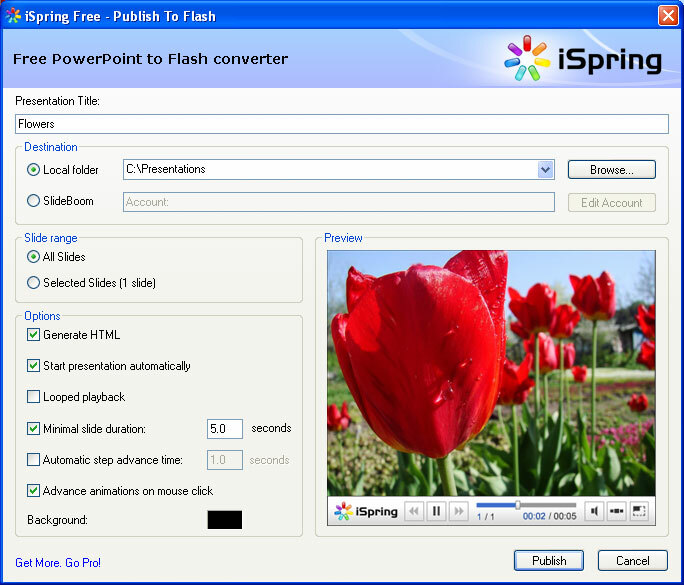 iSpring PowerPoint to Flash converter handles whatever you throw. ...... initial PowerPoint presentation. iSpring PowerPoint to Flash converter handles whatever you throw at your PowerPoint slides from animations and transition effects to images and videos which maintain their crisp look throughout the conversion process. All of which adds up to a Flash presentation that looks as if it were professionally created just for you. iSpring Pro adds an extra tab to your PowerPoint toolbar and transforms the standard MS Office application into a Flash creating wizard. Apply just a few, or all of the professional control features, making this one of the most advanced PowerPoint to Flash tools in the market. Qweas is providing links to iSpring Pro 5.5 as a courtesy, and makes no representations regarding iSpring Pro or any other applications or any information related thereto. Any questions, complaints or claims regarding this application iSpring Pro 5.5 must be directed to the appropriate software vendor. You may click the publisher link of iSpring Pro on the top of this page to get more details about the vendor.